And there are many variables within these parameters. One of the variables that determine how easily fuel ignites is the amount of moisture both within the fuel and in the environment in which the fire occurs. At the most hazardous end of the spectrum, the driest fuel in the landscape is dead vegetation during our dry season on a hot day. At the least hazardous end of the spectrum is vegetation with high moisture content on a rainy day. Using these variables we will consider how likely eucalypts and other non-native trees are to ignite compared to native trees. We were inspired to consider this topic today by a foggy morning in the East Bay. Foggy mornings are frequent events in the Bay Area, particularly during the summer months. When the interior valleys heat up, the hot air collides with the cool air from the ocean, producing fog. The hotter the air is in the interior, relative to the cool ocean air, the more fog we experience along the coast. Walking a favorite trail in Redwood Park this morning, the fog shrouded the valley below us. It was otherwise a dry day. The dirt trail was dry except under the Monterey pines along the trail. 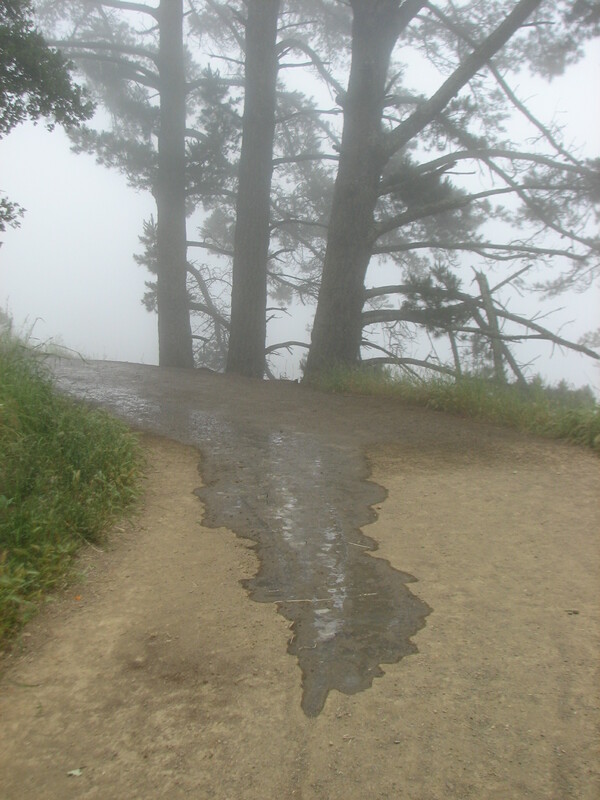 The pines “caught” the fog and dripped water onto the trail, making puddles on the trail. Although there are oaks and bays alongside the trail as well, they don’t condense as much fog because they are not as tall. Harold Gilliam in Weather of the San Francisco Bay Area is specific in crediting the tall, non-native trees for their ability to condense the fog drip: “Eucalyptus and pine groves planted there long ago intercept large amounts of fog and cause a rainlike deposit of moisture. The fog drip during the summer months has been measured at a surprising 10 inches, an amount nearly half as great as the total rainfall…” Average rainfall in the East Bay is 22 inches per year, so this fog precipitation adds nearly 50% to total precipitation. By contributing moisture during the otherwise dry time of the year, tall non-native trees reduce fire danger. The moisture content of the vegetation itself is another factor in how easily it will ignite. Other conditions being equal, the more moisture within the vegetation the less likely it is to ignite. Carol Rice is a credible source of information about the moisture content of native vegetation in the East Bay hills because she is one of the authors of the East Bay Regional Park District’s “Wildfire Hazard Reduction and Resource Management Plan.” Ms. Rice monitored 7 species of native plants and trees in the North Coastal Scrub and Oak-Bay vegetation types for her Master’s Degree. Here are quotes from her Master’s Degree dissertation (“Live Fuel Moisture, Fuel Bed Characteristics, and Fire Vegetation in the Berkeley/Oakland Hills,” UC Berkeley, 1987). 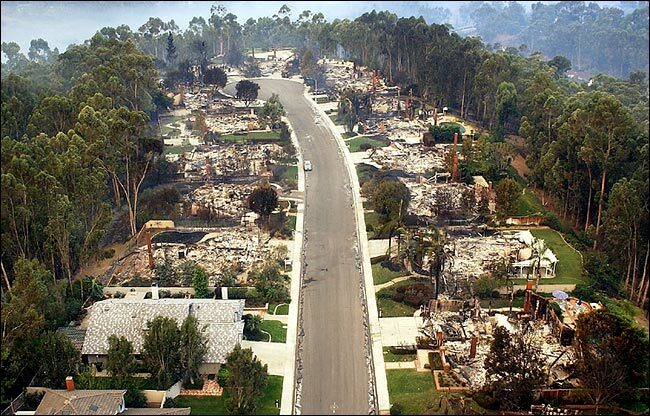 “The dead to live fuel ratios [of the vegetation] were high: 46%…on the west aspect was dead, 60%..on the east aspect was dead.” Recall that dead vegetation is drier than living vegetation and is therefore easier to ignite. We don’t have comparable information regarding moisture for the eucalyptus because moisture content varies by specific location and climate conditions. However, the literature generalizes the moisture content of the eucalyptus leaf as roughly 50%, which suggests that the eucalyptus leaf does not contain less moisture than an oak leaf. Another factor in the likelihood of ignition is the degree to which the leaf litter and duff layers under the trees absorb moisture. Generally, the more moist the leaf litter and duff layers, the more difficult they are to ignite by embers or fire spreading through the understory of the forest. Robert Shroeder and Robert Martin (UC Berkeley) studied the ignitability of leaf litter and duff layers of Monterey pine and Redwood in the laboratory. In “Ember Ignitability of Pinus Radiata and Sequoia Sempervirens Litter: Methodology and Results” (in “Proceedings of California’s 2001 Wildfire Conference: 10 Years After the 1991 East Bay Hills Fire”) they report that although the litter of the Monterey pine is slightly more likely to ignite than equally moist litter of the Redwood, the litter of the Redwood is more resistant to moisture and is therefore more likely to ignite. Isolating just one of many factors in predicting wildfire hazard–moisture– we conclude that there is no evidence that non-native trees are more likely to ignite than native trees in comparable conditions. We will examine other factors in determining fire hazard in later posts. (1) Ms. Rice expressed percent of moisture as a ratio of (moisture plus dry weight) divided by dry weight. The more usual expression of moisture content is a ratio of moisture divided by dry weight. We have converted her numbers to conform to this standard method of describing moisture content of leaves. Thanks for this valuable article. Tampering with the eucalyptus forests will clearly change micro-climates and make them drier. It seems to me that any thorough discussion of this issue should also examine volatile hydrocarbons (pitch, oils, etc.) I don’t know how these factors effect relative flammability, but even if they are not the #1 factor, they must have some impact on it. Does anyone have any verifiable data? Yes, BB, volatile oils and resins are said by fire experts to increase the potential for ignition, and we have acknowledged that in earlier posts, now available in the archive (“Common Characteristics”). However, it’s not a factor that separates natives from non-natives because one of our most prominent natives, the California bay laurel, is indistinguishable from eucalyptus in that regard: “In the fruit, there are essential oils and fatty oils present. The fruit is pressed and water extracted to obtain these products. The fruit contains up to 30% fatty oils and about 1% essential oils…The leaves contain about 1.3% essential oils (Ol. Lauri folii), consisting of 45% eucalyptol…” (http://en.wikipedia.org/wiki/Bay_laurel). In other words, the predominant oil in the leaf of bay laurel is the same oil in the leaf of eucalypts. Scientists at the University of Tasmania conducted laboratory experiments on the plants and trees in the Tasmanian forest to determine the relative flammability of their native species. The predominant eucalyptus species in the San Francisco Bay Area, the Blue Gum eucalyptus (E. globulus), is native to Tasmania and was therefore included in this study. The study reports that, “E. globulus leaves, both juvenile and adult, presented the greatest resistance [to ignition] of all the eucalypts studied. In this case, leaf thickness was important as well as the presence of a waxy cuticle.” Also, in a table entitled “Rate of flame front movement, the comment for E. globulus leaves is “resistant to combustion.” In other words, despite the oil content in the leaf, its physical properties protect the leaf from ignition. Thank you for your comment. We should devote a post to this issue. (1) Dickinson, K.J.M. and Kirkpatrick, J.B., “The flammability and energy content of some important plant species and fuel components in the forests of southeastern Tasmania,” Journal of Biogeography, 1985, 12: 121-134.